Reference number for this case: 17-Oct-54-Le-Bouquet. Thank you for including this reference number in any correspondence with me regarding this case. We accounted yesterday how a farmer of the surroundings of Entraigues had seen Thursday, at 6 p.m., above this locality a disc shaped craft. The same day, more in the north, and a few minutes later, in Pierrelatte, at the edge of main road RN7, a former geometrician of the Geographical Institute of the Army, Mr. Na..., in company of his wife, saw "a large luminous ball separated by a non-luminous space". In the evening of Sunday, at 10:50 p.m., la population of the small village of Lirac in the Gard, at forty kilometers in the North-West of Avignon, saw with astonishment the "play" of several luminous red balls which exceeded themselves several times in continuation above the locality before disappearing. Ufologist and author Jean Sider discovered this case in the newspaper Le Midi Libre for October 19, 1954. The case occurred at approximately 03:00 p.m. on October 17, 1954 at Le Bouquet near the city of Alès in the department of Gard. Mr. Soulier, shoemaker in Vézénobre, was out hunting when he perceived a noise similar to that of a chain going down to the bottom of a well. He was intrigued and looked up and saw within thirty meters of altitude only an apparatus of cylindrical shape which went down vertically towards the ground. The craft, which appeared as a metalized blue cigar, had five to six meters in height by three meters in diameter and had four crutches at its base. It remained motionless during more than one minute then went back vertically at a vertiginous pace. The witness, at this time, heard the chain noise again. The website indicates that on 17 October 1954 at 15:00, in Le Bouquet, France, there was a sighting. The website indicates that the source is "Hatch, Larry, *U* computer database, Author, Redwood City, 2002." 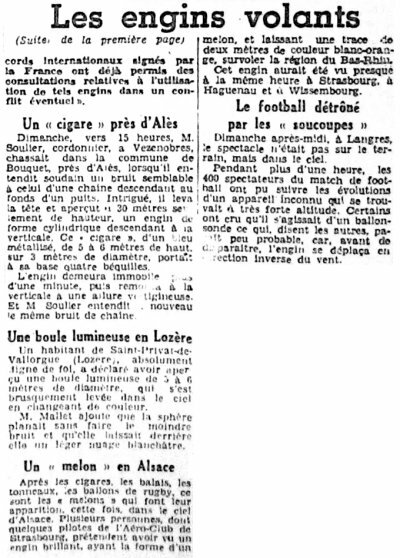 [ml1] Article in the regional newspaper Le Midi Libre, Montpellier, France, page 3, October 19, 1954. [js1] "Le Dossier 1954 et l'Imposture Rationaliste", book by Jean Sider, Ramuel publisher, France, page 112, 1997. 0.1 Patrick Gross March 26, 2005 First published. 1.0 Patrick Gross January 28, 2009 Conversion from HTML to XHTML Strict. First formal version. Addition [ud1].